One line of metallic Us, displaying a remarkable illusion of transparency, manages to stress a subtext of individualized industry pervasive throughout the show. Thought the artifacts are industrial and repeatable they are also personalized, born out of a decisive collaborative process between the artist and the machine. The U sculptures, which have both an industrial style and a linguistic shape, manage to undo the complicity between the customizable and the commercially ubiquitous. Untitled, 2002. Epson DURABrite inkjet on book page, 10 3/8 x 7 3/8 in. (26.4 x 18.7 cm). Collection of the artist. Photograph by Ron Amstutz. Letters make various appearances in Guyton’s work, though relegated to U and X: printed Us dangling over flames, layered or half-printed black Xs. Essential letters of the text/Twitter/Internet lexicon, here they are utilized more as repeatable marks from a computer. Further enforcing the everydayness of the works are their frequent constructive failures. Perhaps the printer has mauled every canvas and drawing. One noteworthy early experiment on linen was cut sharply; the cut hangs limply against the wall, serving as an almost unsettling reminder of technology’s strength over fragile materials. Guyton’s most consistent obsession is with the relationship between objects and their physical space: their space within the gallery as much as their physical provenance. Untitled Action Sculpture (Five Enron Chairs) presents a color scale of Marcel Breuer-designed Cesca chairs that originally graced Enron’s corporate headquarters, while many of Guyton’s printer drawings are shown in glass display cases lined with blue linoleum, like that of Guyton’s studio—bringing with the printer drawings something of the site of their creation. Works created for specific locations are also present: gray canvases made for the walls of a Guyton show in Europe, and new stripes especially for the Whitney. 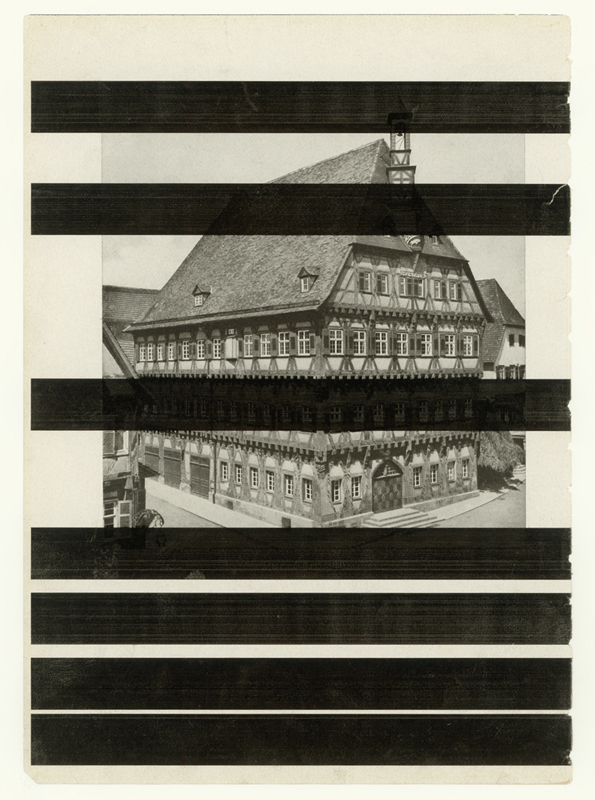 The stripes—taken from the familiar endpaper of a book—have been exploded, and display a structure to the image not dissimilar from Ben-Day dots. Following a similar statement by Robert Rauschenberg, Duchamp had by 1961 announced, "Since the tubes of paint used by the artist are manufactured and readymade products, we must conclude that all the paintings in the world are 'ready-mades aided’ and also works of assemblage.” The colors here may come not from tubes but inkjets, but the works emerge more as validations of strategies than reinvestigations or expansions. Untitled, 2008. Epson Ultrachrome inkjet on linen; eight panels, 84 x 69 in. (213.4 x 175.3 cm) each; 84 X 587 x 1 ½ in. (213.4 x 1491 x 3.8 cm) overall. Photograph by Lamay Photo.